The mission of the Cooperstown Food Pantry is to deal with issues of poverty and hunger in northern Otsego County by acquiring, storing and providing food and personal care supplies to individuals and families, thereby reducing hunger and improving nutrition. Currently in its 42nd year, the Cooperstown Food Pantry provides an important safety net for area families forced to choose between paying for utilities, medicine, gasoline or food. We are a tax-exempt organization through our sponsoring agency, the First Presbyterian Church of Cooperstown, and all contributions made to Cooperstown Food Pantry are fully tax-deductible as allowed by law. In 1977, Ellen St. John of Cooperstown started the Cooperstown Food Pantry, then known as the Cooperstown Food Bank, in a closet at the village library. In 1992, the First Presbyterian Church provided space which included the entire basement of the Church House. In 2014 the pantry moved to a newly renovated first floor location in the same building. The name Food Pantry is a newer designation for membership in Feeding America (formerly America’s Second Harvest), a network of over 250 huge, regional food banks serving all 50 states and Puerto Rico. Cooperstown is a member agency of The Regional Food Bank of Northeastern NY located in Latham, near Albany. Founding director, Ellen St. John retired in May of 2013 after 36 years. She remains an active volunteer. Her strong leadership, gentle wisdom, and compassion for others has helped to make the food pantry such an important part of the Cooperstown community. Her vision, influence and enthusiastic helping hands continue to inspire the organization. The pantry has made a recent change from a volunteer executive staff to a paid Director. Prior to the decision to go to a paid Director Audrey Murray was the pantries volunteer Director for 10 years. Audrey began volunteering with the Cooperstown Food Pantry in 2006, becoming Founding Director Ellen St John’s Co-Director in 2007. She became Director in 2013 after Ellen’s retirement. Stacey Smith took over as the first paid Director of the pantry on November 8, 2017. The Food Pantry serves people living in the northern two-thirds of Otsego County. 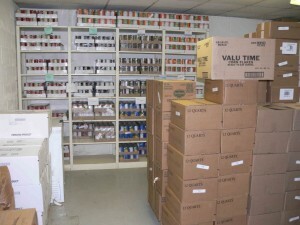 For many, the Food Pantry is the first place families in crisis turn to for help. People are surprised to learn that nearly 50% of clients visit just once or twice a year. Visits are prompted by unemployment, underemployment, illness, injury, divorce, domestic violence, unexpected bills and car repairs. Often those seeking help are outside the Social Service system. Referrals are not required, payment in any form is never accepted, and no one is ever turned away. Many clients visit when taxes are due or when heating costs peak. Summer is also busy since children who take advantage of free or low cost breakfast and lunch are eating at home. As a member of Feeding America, the largest hunger relief organization in the country, we have access to a wide variety of products. About 80% of what we distribute we purchase through the Regional Food Bank of Northeastern New York, in Latham. Manufacturers, retailers, wholesalers and farmers donate both first quality food and personal care items, as well as discontinued product lines, overproduction and production flaws, mislabeling or shipping errors, cosmetic flaws, under-harvested or imperfect produce and code dated products. We purchase donated and salvage goods for 16 cents per pound. 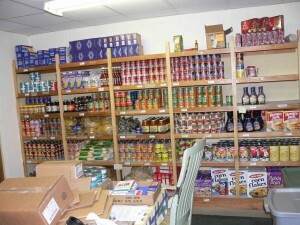 Other grocery items are offered at market wholesale prices. USDA products, which we also obtain via the regional food bank, are obtained at no charge. Feeding America estimates that we purchase about $10 worth of items for every dollar that we spend as a member of our regional food bank.